As much as we love sweets at home, both the husband and daughter like these crunchy, munchy savory snacks, especially along with the evening coffee or tea. 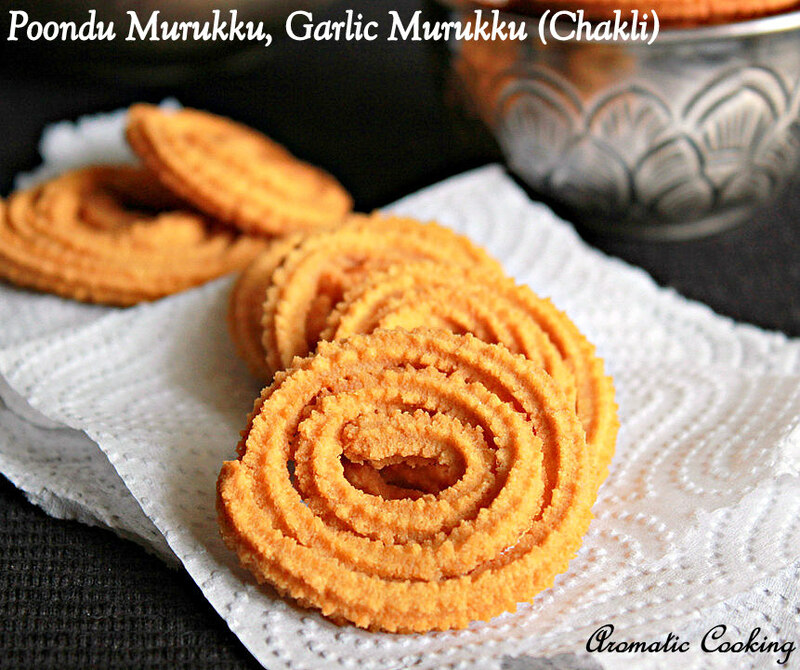 So the next one that I tried for this Diwali is this Garlic Murukku, Poondu Murukku/Chakli. 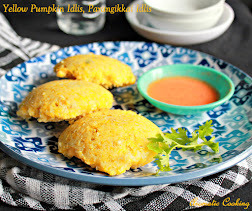 This is again a very easy snack, we don't need any specially prepared flours for it, I have just used store bought organic besan flour and rice flour for these murukkus. 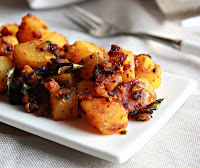 They turned out very good with a delicious garlic and curry leaves flavor and we loved it.. 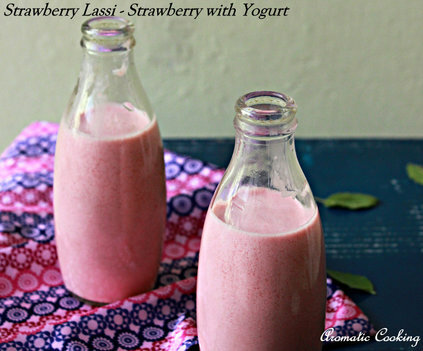 Grind the ingredients given under ' to grind ' along with some water to a smooth paste as possible. Sieve both the flours together, add the salt and add a little water to the paste, strain the paste and add the water to the flours ( not the paste ) and mix. Then add the hot oil and start making a smooth and soft dough ( soft enough to press through the Murukku Press ). 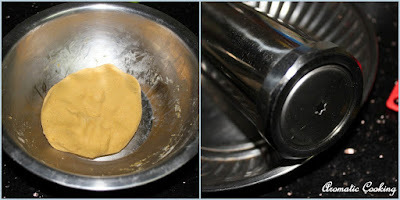 If you need more water for making the dough, either add some more water to the strained paste and again strain it and add or just some plain water. Once the dough is ready, get your Murukku Press ready with single star disc ( grease the disc and the inside of the press ). 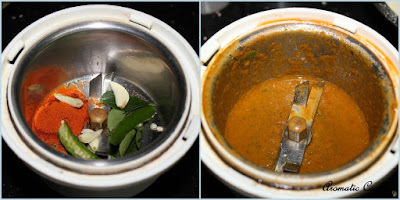 Now add a little dough into the press and press out murukkus on the back of a ladle, like shown in the picture. On the side, we should have started heating the oil for deep frying. Once the oil is hot enough ( a piece of dough dropped in the oil, should rise up fast ), reduce the heat to medium-low and add the pressed out murukkus ( just flip the ladle ). You can add 2 or 3 at the time, depending on the size of the murukku and the amount of oil you are using for deep frying. 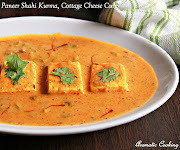 Once the sizzling dies down to a few bubbles and the murukkus have turned golden, remove them and drain the excess oil. Finish the rest of the dough the same way. Once the murukkus have cooled down completely, store them in an airtight container. 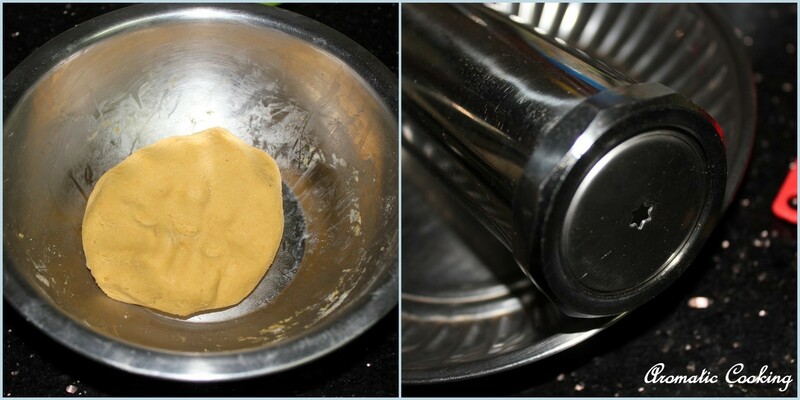 If you're making a large quantity, then you can grind the ingredients given under 'to grind' into a smooth paste and add the paste to the flours and make the dough. Since I was doing a small quantity, it was very difficult to get a smooth paste, that's why I added the water and strained the liquid and added. 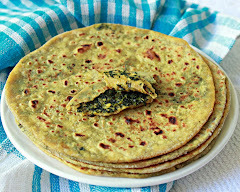 Also, when making large quantities, do everything till mixing the paste to the flours, after that take a small quantity like above, mix water, make the dough and make the murukkus, then take another small quantity and do, don't make the final dough with the entire quantity and keep. 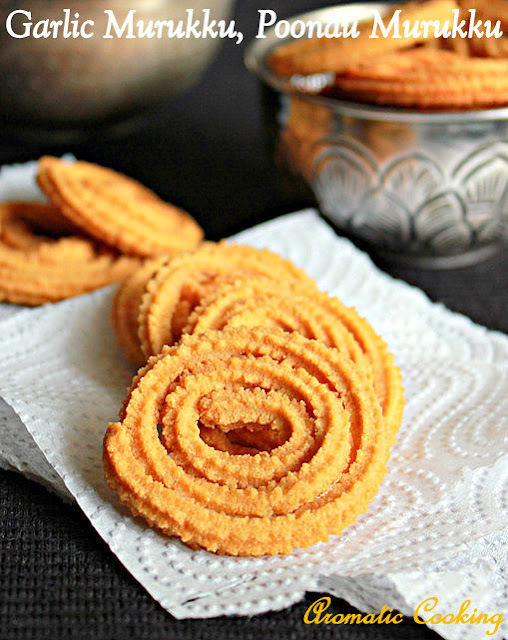 If the dough dries up a little and it's difficult to press out the murukku, then wet your hands with water and mix the dough, this will soften the dough. The chilly powder that I had was not spicy, so I added 1 teaspoon for the above quantity, you add accordingly, also if you are adding the paste to the flour, then the above quantity of ground paste would be enough for double the quantity of flour. Looks really crispy and delicious! Happy Diwali to you and your loved ones.